Home / Automobiles / product or service reviews / Upgrade to New Tigor Styleback from Tata Motors! It was in the news for a while that a compact sedan version of Tiago is on the cards. Originally code named as Kite, the suspense that lasted for over an year recently ended, with Tata Motors displaying Tigor at Geneva Motor show 2017. I had the privilege of being part of an exclusive media drive and preview offered by Tata Motors to select bloggers and journalists. 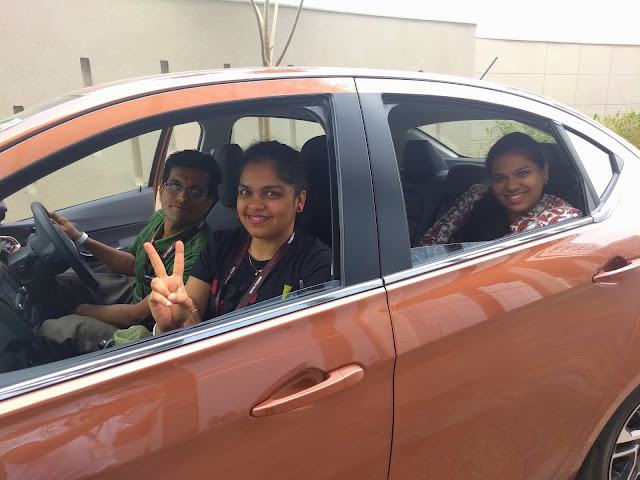 This post shares my finding about the new Tata Tigor and feedback after driving it for half a day. Tigor is more than just Tiago with a boot. Most manufacturers when launching compact sedans do not make any mechanical changes other than adding a boot to the hatchback. The wheelbase, suspension, engine options are often left unchanged. W.r.t Tigor, there’s more than what meets the eye. What Tigor gets over and above Tiago? Interiors: Tigor gets a climate control, rear seat middle armrest and touchscreen system inside. Exteriors: Boot with 390 litres space (150 litres more than Tiago), New headlamp assembly, Stylish LED lamps in the rear, chrome inserts, bigger diamond cut alloy wheels. Structural: Longer wheel base (2450 mm, 50 more than Tiago), body 30 mm wider than Tiago, better dual path suspension. Minor enhancements in Petrol variant to reduce noise levels. Of course lots of body panels are shared with Tiago, so is the engine options. This is obviously to achieve economy of scale. As per Vivek B Srivatsa, Tigor is targeted at owners of an existing small car who are looking to upgrade. These customers are well aware of the shortcomings in their current cars and will be keen to have some premium features, without having to shell out lots of money. 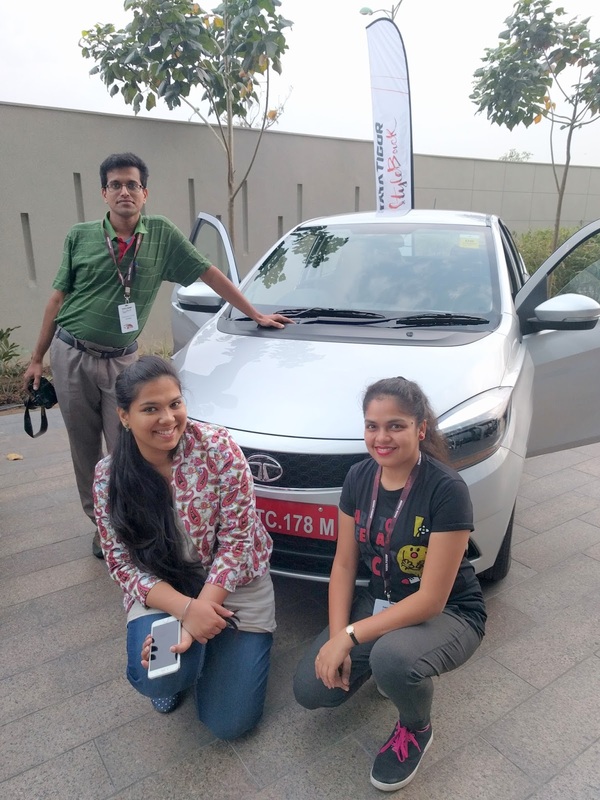 Customers in this segment have lots of expectation from their cars- they want their machines to be an all-rounders- be good in city and highway, stylish, economic to run and maintain and the car that can represent their personality. But they are also budget constrained. Upgrade options for such customers are typically either a compact sedan or a premium hatch. The compact sedan market (a segment pioneered by Tata Motors with Indigo) is highly crowded with at least half a dozen contenders- Dzire, Ameo, Amaze, Aspire, Xcent and so on. They all look like a boot force fitted on to the corresponding hatchbacks and fail to stand out on their own. Buying them won't turn heads. Premium hatchbacks (i20, Baleno, Polo cross etc) on the other hand usually offer some more interior features, fancy exteriors and may be bit more power but do not add much advantages over the hatch in terms of space and practicality. While customers are spoilt for choice, there is good chance of winning more hearts if the product is stylish, reliable, feature rich and yet affordable. That is what Tata Motors is looking to achieve from the new Tigor Styleback. Tata Motors is presenting Tigor as a stylish car, which is apparent from its byline- Styleback. It is stylish indeed. While front is same as Tiago, on the rear the view is stunning. The boot doesn’t protrude much from the C pillar but don’t let that deceive your eyes. The Tigor’s wheel base is longer than Tiagos by 50mm and it creates more roominess in second row as well as in the boot. 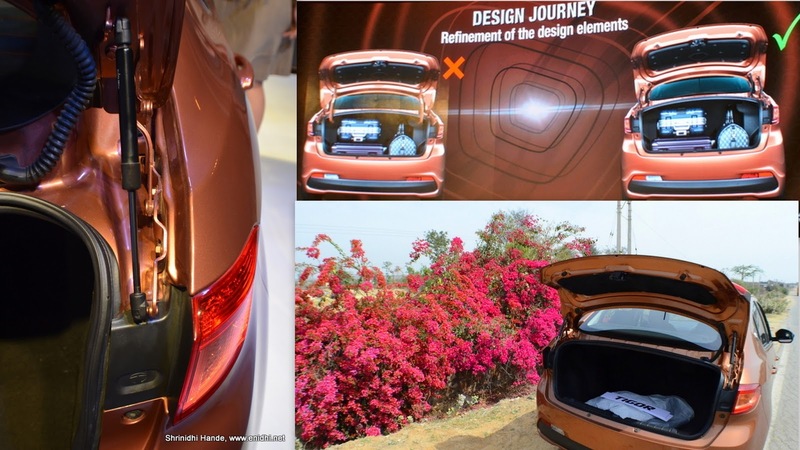 Rear tail lamps smoothly curve into side profile, extending the appeal to the side. On top of the rear windshield, the red LED lamps add to style statement. Tigor is the 3rd car from Tata's new IMPACT design philosophy- the other 2 being Tiago and Hexa. Notice how the display car was positioned at the 1AQ in New Delhi- focus is on the rear, which offers a seamlessly integrating boot. Interior: Climate Control, Touchscreen with navigation and rear camera, Juke app (lets all passengers queue their songs instead of fighting for control). 24 smart utility storages- to keep toll receipts, coins, water bottles and so on, rear seat middle arm rest, driver seat height adjustment, tilt adjustment for steering. Steering unit is EPAS (Electric Power Adjusted Steering). Interior is dual tone colour with body colour inserts on air vents, patterned seats with bolsters, premium knitted roofliner and more. Second row seat extends door to door- offering maximum support and enabling easy ingress and egress (entry and exit). Harman made 8 speaker units (4 speakers + 4 tweeters) is perfect for music freaks. Instrument cluster tells you which exact door is open, has all the info you need- avg fuel economy, instantaneous fuel economy and a dozen more. Tigor is 30 mm wider than Tiago. Doesn't sound like a big number, but when the car is loaded with passengers, every mm makes the difference in comfort. Stylish rear boot with 390 litre space is the highlight of Tigor- best in class and fully usable. (Most sedans are fitted with goose-neck hinges that occupy their own space when folded- you need to keep the bag in centre only, keeping space free for the hinge to operate. In Tigor, a 4 bar mechanical + pneumatic hinge is positioned on the extreme side of the boot, without coming in the way of your bags. You will get entire 420 litres of space at your disposal. Very clever thinking and implementation. Even 10 lakh+ sedans have the same old goose-neck hinge. 420 litres or 390 litres? I read and heard the space as 420 litres, but official product spec shared with us mention bootspace as 390 litres, hence I am going with that number. Diamond cut alloy wheels look stunning- standard offering on XZ petrol. Diesel top-end had traditional white alloy wheels. An inch bigger than Tiago (175/60 R15 for Tigor vs R14 in Tiago). Surprisingly ground clearance number remains same for both Tiago and Tigor at 170mm. We had the unique opportunity to drive this car for about half a day, 100 kms around Delhi. Tigor has same engines from Tiago- the 1.2 litre Revotron Petrol and a 1.05 litre Revotorq diesel producing 85PS and 70 PS respectively from their 3 cylinders. We began with diesel and then switched to petrol for the return trip. Petrol version is reportedly improved a bit to reduce NVH levels, diesel is largely unchanged. Now the car comes with better suspension, giving more confidence during the drive- particularly sharp turns and bad roads. I had two nice ladies in my team- Divyakshi Gupta and Stuti. While I focused on the drive, they explored all the features the Tigor had to offer. We tried the navigation, music systems, touchscreen and more. I drove straight to the destination- Heritage Transport Museum. I feel I should have stopped at more places for photos. 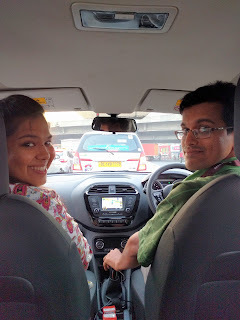 Do check their blogs for their review of the Tigor Experience. During the limited time and opportunities I had, I checked out the car as much as possible. Tried sharp turns on the U turns at high speed, tried acceleration and braking, drove on a rocky parking lot. I couldn't find anything to complain about. This is keeping in mind car's category and peers. Tigor Petrol is almost at par with its competition in terms of power. But diesel is not the most powerful car among its peers. But then Tigor is aimed more that cost conscious customers. Expect Tigor's pricing to be a lakh or two cheaper than corresponding competition variants- this would make up for any shortfalls. No AMT version is planned at launch time. Expect it to be offered few months later. Starts at 4.7 lakhs for XE Petrol, goes upto 7.1 lakh for XZ(O) Diesel MT. Ex-showroom Delhi. Add 25% for on road in your city. Tata Tigor Key strengths: Stylish rear and spacious boot, interior features (Climate control, navigation, rear camera, Juke App etc), likely aggressive pricing. Limitations: Missing safety features such as ABS in cheaper variants (Only XZ gets them), diesel has slightly less power than its peers. Overall it is a nice package by Tata Motors, offering right combination of style, features, space and driving experience, at affordable price. I wish all the success for the new Tigor Styleback. Do not miss to check it out at the Tata Motors showroom near you. Coming up next: Tata Tigor's comparison with competition and my guesswork on Tigor's pricing. I think this will be an ideal family car. The interiors is so well designed, there is a place for everything. Loved to read. Beautiful car. Indian govt. has already established mandatory guidelines for cars to have ABS, 2 airbags as a standard feature and will be implemented after October 2017 I guess. Why isn't Tata already following this? Are Tigor and Nexon BS4 compliant already? Seems to be a nice car.But Tata cars are not selling in big nos still.They need to do something more to attract customers. @Vipul- Let us wait till MArch 29th for the official variant wise details. October is still 6 months away- Tata can adapt by then.